Laura Harrier has been promoting her new film but she stepped out for a different occasion last night(August 9th). The actress was on hand for the 2018 HFPA Annual Grants Banquet at The Beverly Hilton Hotel in Beverly Hills, CA. 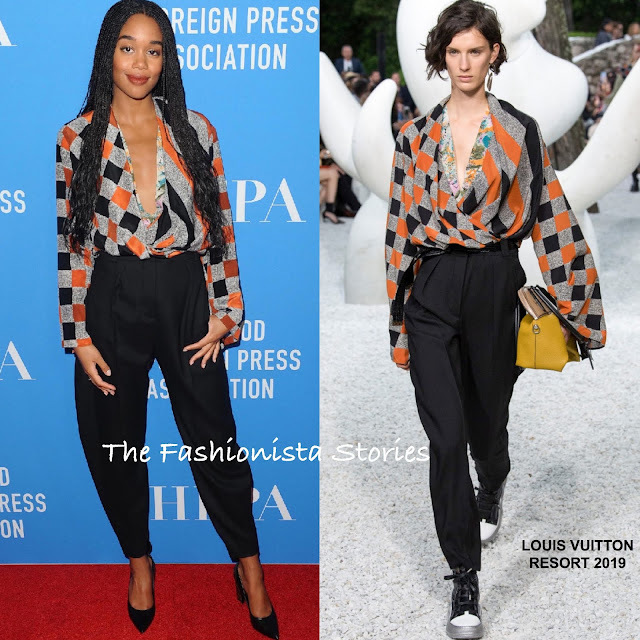 Turning to LOUIS VUITTON of course, she wore a RESORT 2019 long sleeve printed, draped v-neck top and black pleated, ankle length trousers. On the runway, the top was shown in an over-sized version but I think Laura's size worked better for her. Center part, long braids, a colored lip and black pumps finished up her great look.